Many, many years ago there lived in Nara, the ancient Capital of Japan, a wise State minister, by name Prince Toyonari Fujiwara. His wife was a noble, good, and beautiful woman called Princess Murasaki (Violet). They had been married by their respective families according to Japanese custom when very young and had lived together happily ever since. They had, however, one cause for great sorrow, for as the years went by no child was born to them. This made them very unhappy, for they both longed to see a child of their own who would grow up to gladden their old age, carry on the family name and keep up the ancestral rites when they were dead. The Prince and his lovely wife, after long consultation and much thought, determined to make a pilgrimage to the temple of Hase-no-Kwannon (Goddess of Mercy at Hase), for they believed, according to the beautiful tradition of their religion, that the Mother of Mercy, Kwannon, comes to answer the prayers of mortals in the form that they need the most. Surely after all these years of prayer she would come to them in the form of a beloved child in answer to their special pilgrimage, for that was the greatest need of their two lives. Everything else they had that this life could give them but it was all as nothing because the cry of their hearts was unsatisfied. A daughter was born at last to the Princess Murasaki and great was the joy of her heart. She and her husband decided to their duaghter Hase-Hime, or the Princess of Hase, because she was the gift of the Kwannon at that place. They reared her with great care and tenderness and the child grew in strength and beauty. Hase-Hime listened in an attitude of respect while her mother spoke and promised to do all that she was told. 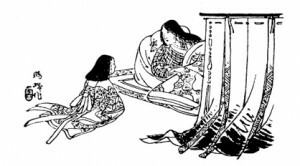 There is a proverb which says “As the soul is at three so it is at one hundred,” and so Hase-Hime grew up as her mother had wished, a good and obedient little Princess, though she was now too young to understand how great was the loss of her mother. But Hase-Hime bore every unkindness with patience, waited upon her step-mother kindly, obeyed her in every way and never gave any trouble, just as she had been trained by her own good mother, so that the Lady Terute had no cause for complaint against her. The little Princess was very diligent and her favorite studies were music and poetry. She would spend several hours practising every day and her father had the most proficient of masters he could find to teach her the koto (Japanese harp) and the art of writing letters and verse. When she was twelve years of age she could play so beautifully that she and her step-mother were summoned to the Palace to perform before the Emperor. It was the Festival of the Cherry Flowers and there were great festivities at the Court. The Emperor threw himself into the enjoyment of the season and commanded that Princess Hase should perform before him on the koto, and that her mother Princess Terute should accompany her on the flute. The Emperor sat on a raised dais, before which was hung a curtain of finely-sliced bamboo and purple tassels, so that His Majesty might see all and not be seen, for no ordinary subject was allowed to looked upon his sacred face. Hase-Hime was a skilled musician, though so young and often astonished her masters by her wonderful memory and talent. On this momentous occasion she played well. But Princess Terute, her step-mother, who was a lazy woman and never took the trouble to practise daily, broke down in her accompaniment and had to request one of the Court ladies to take her place. This was a great disgrace and she was furiously jealous to think that she had failed where her step-daughter had succeeded; and to make matters worse the Emperor sent many beautiful gifts to the little Princess to reward her for playing so well at the Palace. And never having learned to control herself, she allowed this wicked thought to grow into the awful desire of taking her step-daughter’s life. So one day she secretly ordered some poison and poisoned some sweet wine. This poisoned wine she put into a bottle. Into another similar bottle she poured some good wine. It was the occasion of the Boys’ Festival on the fifth of May and Hase-Hime was playing with her little brother. All his toy warriors and heroes were spread out and she was telling him wonderful stories about each of them. They were both enjoying themselves and laughing merrily with their attendants when his mother entered with the two bottles of wine and some delicious cakes. Hase-Hime, never dreaming of the dreadful part her step-mother was acting, took one of the cups of wine and gave to her little step brother the other that had been poured out for him. The wicked woman had carefully marked the poisoned bottle but, on coming into the room, she had grown nervous and, pouring out the wine hurriedly, had unconsciously given the poisoned cup to her own child. All this time she was anxiously watching the little Princess but, to her amazement, no change whatever took place in the young girl’s face. Suddenly the little boy screamed and threw himself on the floor, doubled up with pain. His mother flew to him, taking the precaution to upset the two tiny jars of wine which she had brought into the room, and lifted him up. The attendants rushed for the doctor, but nothing could save the child – he died within the hour in his mother’s arms. Doctors did not know much in those ancient times and it was thought that the wine had disagreed with the boy, causing convulsions of which he died. Thus was the wicked woman punished in losing her own child when she had tried to do away with her step-daughter; but instead of blaming herself she began to hate Hase-Hime more than ever in the bitterness and wretchedness of her own heart, and she eagerly watched for an opportunity to do her harm, which was, however, long in coming. When Hase-Hime was thirteen years of age, she had already become noticed as a poetess of some merit. This was an accomplishment very much cultivated by the women of old Japan and one held in high esteem. It was the rainy season at Nara and floods were reported every day as doing damage in the neighborhood. The river Tatsuta, which flowed through the Imperial Palace grounds, was swollen to the top of its banks and the roaring of the torrents of water rushing along its narrow bed so disturbed the Emperor’s rest day and night that a serious nervous disorder was the result. An Imperial Edict was sent forth to all the Buddhist temples commanding the priests to offer up continuous prayers to Heaven to stop the noise of the flood. But this was to no avail. Then it was whispered in Court circles that the Princess Hase, the daughter of Prince Toyonari Fujiwara, second minister at Court, was the most gifted poetess of the day, though still so young, and her masters confirmed the report. Long ago, a beautiful and gifted maiden-poetess had moved Heaven by praying in verse, had brought down rain upon a land famished with drought – so said the ancient biographers of the poetess Ono-no-Komachi. If the Princess Hase were to write a poem and offer it in prayer, might it not stop the noise of the rushing river and remove the cause of the Imperial illness? What the Court said at last reached the ears of the Emperor himself, and he sent an order to the minister Prince Toyonari to this effect. Great indeed was Hase-Hime’s fear and astonishment when her father sent for her and told her what was required of her. Heavy, indeed, was the duty that was laid on her young shoulders – that of saving the Emperor’s life by the merit of her verse. At last the day came and her poem was finished. It was written on a sheet of paper heavily flecked with gold-dust. With her father and attendants and some of the Court officials, she proceeded to the bank of the roaring torrent and, raising up her heart to Heaven, read aloud the poem she had composed, lifting it heavenwards in her two hands. Strange indeed it seemed to all those standing round. The waters ceased their roaring and the river was quiet in direct answer to her prayer. After this the Emperor soon recovered his health. His Majesty was highly pleased and summoned her to the Palace and rewarded her with the rank of Chinjo – that of Lieutenant-General. From that time she was called Chinjo-hime, or the Lieutenant-General Princess, and was respected and loved by all. There was only one person who was not pleased at Hase-Hime’s success. That one was her stepmother. Forever brooding over the death of her own child whom she had killed when trying to poison her step-daughter, she had the mortification of seeing her rise to power and honor, marked by Imperial favor and the admiration of the whole Court. Her envy and jealousy burned in her heart like fire. Many were the lies she carried to her husband about Hase-Hime, but all to no purpose. He would listen to none of her tales, telling her sharply that she was quite mistaken. At last the step-mother, seizing the opportunity of her husband’s absence, ordered one of her old servants to take the innocent girl to the Hibari Mountains, the wildest part of the country, and to kill her there. She invented a dreadful story about the little Princess, saying that this was the only way to prevent disgrace falling upon the family – by killing her. Katoda, her vassal, was bound to obey his mistress. He saw that the wisest plan would be to pretend obedience in the absence of the girl’s father, so he placed Hase-Hime in a palanquin and accompanied her to the most solitary place he could find in the wild district. The poor child knew there was no good in protesting to her unkind step-mother at being sent away in this strange manner, so she went as she was told. But the old servant knew that the young Princess was quite innocent of all the things her step-mother had invented as reasons for her outrageous orders, and he determined to save her life. Unless he killed her, however, he could not return to his cruel task-mistress, so he decided to stay out in the wilderness. With the help of some peasants he soon built a little cottage. He sent secretly for his wife to join him and then these two good old people did all in their power to take care of the now unfortunate Princess. She all the time trusted in her father, knowing that, as soon as he returned home and found her absent, he would search for her. Prince Toyonari, after some weeks, came home, and was told by his wife that his daughter Hime had done something wrong and had run away for fear of being punished. He was nearly ill with anxiety. Everyone in the house told the same story – that Hase-Hime had suddenly disappeared, none of them knew why or whither. For fear of scandal he kept the matter quite and searched everywhere he could think of, but all to no purpose. One day, trying to forget his terrible worry, he called all his men together and told them to make ready for several days’ hunt in the mountains. They were soon ready and mounted, waiting at the gate for their lord. He rode hard and fast to the district of the Hibari Mountains, a great company following him. He was soon far ahead of everyone and at last found himself in a narrow picturesque valley. Looking round and admiring the scenery, he noticed a tiny house on one of the hills quite near, and then he distinctly heard a beautiful clear voice reading aloud. Seized with curiosity as to who could be studying so diligently in such a lonely spot, he dismounted and, leaving his horse to his groom, walked up the hillside and approached the cottage. As he drew nearer his surprise increased, for he could see that the reader was a beautiful girl. The cottage was wide open and she was sitting facing the view. Listening attentively, he heard her reading the Buddhist scriptures with great devotion. More and more curious, he hurried on to the tiny gate and entered the little garden and, looking up, beheld his lost daughter Hase-Hime. She was so intent on what she was saying that she neither heard nor saw her father till he spoke. Taken by surprise, she could hardly realize that it was her own dear father who was calling her and, for a moment, she was utterly bereft of the power to speak or move. “My father, my father! It is indeed you – oh, my father!” was all she could say and, running to him, she caught hold of his thick sleeve and, burying her face, burst into a passion of tears. Her father stroked her dark hair, asking her gently to tell him all that had happened, but she only wept on and he wondered if he were not really dreaming. Then the faithful old servant Katoda came out and, bowing himself to the ground before his master, poured out the long tale of wrong, telling him all that had happened and how it was that he found his daughter in such a wild and desolate spot with only two old servants to take care of her. The Prince’s astonishment and indignation knew no bounds. He gave up the hunt at once and hurried home with his daughter. One of the company galloped ahead to inform the household of the glad news and the step-mother, hearing what had happened and fearful of meeting her husband now that her wickedness was discovered, fled from the house and returned in disgrace to her father’s roof, and nothing more was heard of her. The old servant Katoda was rewarded with the highest promotion in his master’s service and lived happily to the end of his days, devoted to the little Princess, who never forgot that she owed her life to this faithful retainer. She was no longer troubled by an unkind step-mother and her days passed happily and quietly with her father. As Prince Toyonari had no son, he adopted a younger son of one of the Court nobles to be his heir and to marry his daughter Hase-Hime, and in a few years the marriage took place. Hase-Hime lived to a good old age and all said that she was the wisest, most devout and most beautiful mistress that had ever reigned in Prince Toyonari’s ancient house. She had the joy of presenting her son, the future lord of the family, to her father just before he retired from active life. To this day there is preserved a piece of needle-work in one of the Buddhist temples of Kyoto. It is a beautiful piece of tapestry, with the figure of Buddha embroidered in the silky threads drawn from the stem of the lotus. This is said to have been the work of the hands of the good Princess Hase.